November 8, 2018 – Dry weather with above normal temperatures through the forecast period. Strong north to east downslope wind today into Friday morning resulting in critical fire weather conditions. Red Flag Warning until 7 AM Friday and Wind Advisory until 10 PM this evening. High amplitude upper ridging in EPAC with short wave trough digging along leading edge of ridge through NorCal. Surface high extends from EPAC through PacNW into Great Basin. Surface pressure gradient is trending up and is over 4 mb from KRDD-KSAC, over 8 mb from KRDD-KMFR, and nearly 9mb from KSFO-KRNO. 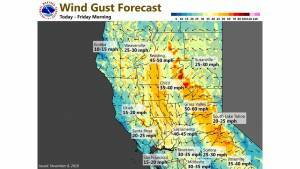 As a result, strong gusty north to east wind will occur across portions of interior NorCal today that will persist into Friday morning. 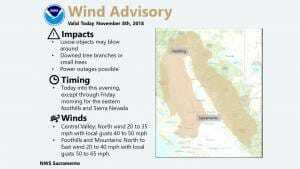 Sustained wind speeds will generally run from 15 to 35 mph with gusts up to 45 mph on western and northern portions of the Central Valley, and up to 60 mph through favorably oriented canyons and over ridges in the foothills and mountains. Downslope wind is also producing a significant lowering in humidity with critical fire weather conditions existing across portions of interior NorCal. Upper trough moving through will bring a few degrees of synoptic cooling in the Central Valley and upwards of 10 degrees in the foothills and mountains. Wind speeds trend down in the Central Valley this evening, but remain strong in portions of the foothills and mountains overnight into tomorrow morning. Lower dewpoints with lighter wind in the Central Valley tonight will produce strong longwave radiational cooling with temperatures dropping into the mid to upper 30s for some locations. Wind sheltered areas in the foothills and mountains could see minimum temperatures in the teens and 20s. Pressure gradients decrease Friday afternoon resulting in decreasing wind. Lighter wind forecast on Saturday, then models suggest increasing wind again Saturday night into Sunday as next short wave moves down leading edge of EPAC upper ridge into the Great Basin. Little change expected in high temperatures Friday into Sunday with low to mid 70s in the Central Valley, and upper 40s to upper 60s for the foothills and mountains. Dry with above normal temperatures through the extended period as upper level high pressure remains over the west coast. Upper ridge axis forecast to center over the west coast on Monday bringing a little warming with substance under the ridge keeping conditions very dry for this time of year. Minimum RH values will drop into the lower teens many areas keeping fire danger fairly high but winds should remain relatively light on Monday. A Pacific frontal system flattens the west coast ridge around next Tuesday afternoon as it moves into the Pacific northwest. This will bring a little cooling and a slightly more onshore flow but otherwise have little impact with winds remaining fairly light and RH values remaining low. Temperatures warm slightly Wednesday and Thursday as upper ridge rebuilds. Winds are still not expected to be especially strong mid week but RH values will stay quite low each afternoon in the dry airmass.